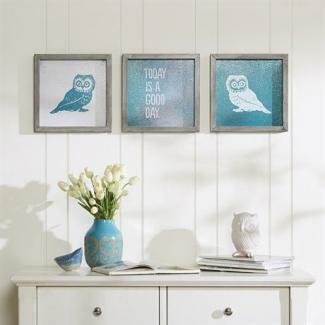 Owls can be a trendy theme for any room in your home. Even if you don't want to redo the entire room's scheme, you can still add owl accents throughout your home that match your current style and colors. Add owl accents to your home by starting with the front door. An attractive owl door knocker sets the mood as you move inside. Select one room and focus on finding the right owl motifs to place within the existing decor. Just different sizes and colors for your accents. Place each item with deliberate consideration for drawing attention deeper into the room design. Each room should have one focus object or grouping that establishes the theme. This can be a large work of art, throw pillows, word art or other decorative object. Many decorative objects used in a home design also have a utilitarian purpose, especially those used in a kitchen. This is a great room to play up the owl theme. There are many owl objects and design items you can add. 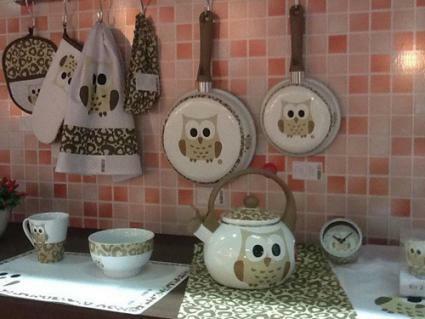 Choose three to five items, such as curtains, a wall clock, and trivets with owl designs. Be sure that you integrate these into your existing décor by paying attention to the use of colors and patterns. This will ensure that any additions look as though they belong. Salt and pepper shakers: Make a cute addition for cooking or on the breakfast table. Rugs: Select from rectangular ones for standing at the sink or a braided round one in front of the range. Canvas art: Add a fun canvas reproduction of a vintage or metal signs. Kitchen valance and curtains: Use over the sink and other windows, consider also for a breakfast nook. Wall clock: Place this where it is easily while working in the kitchen or eating in the breakfast nook. Jars and canisters: Place an owl cookie jar or some condiment canisters on the kitchen counter. Trivets: Leave these on the counter near the oven and range for easy use. The dining room can also reflect the owl image for a stunning motif. It can be used in both formal and informal dining room designs. You may prefer traditional designs or decide to go chic, quirky, or modern. Keep things looking luxurious and elegant by picking owl accents that made from elegant materials or have upscale appeal. 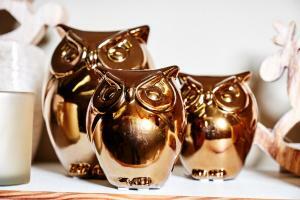 Brass owl: Artistic brass owls can be displayed in a grouping or placed in an antique brass cloche. Lamp: This brass Tiffany bell shade lamp can be placed on a serving tray table or a pair used on a lowboy, buffet, or mantel. An informal dining room may be part of the kitchen or flow from the kitchen to living room or den. Match up those room's styles, or use it as a transitional spot to incorporate colors from those rooms using the owl theme for a cohesive design. Decorative bowl: This bold porcelain black slip bowl is perfect for a modern or contemporary dining room design. Framed art: These turquoise prints have drift wood frame styles and are ideal for a beach-themed home. Draperies: This cute aqua grommet drapery is a playful window treatment for a whimsical dining room choice. Serving tray: Place an owl tray on a buffet or lowboy to hold glassware. The den offers several opportunities to explore different owl motif objects. Depending on the size of this room, you may find it can accommodate more owl objects than other rooms and is a good place to add accessories. For example, if you collect ceramic owl figurines or Swarovski owls you can choose to display them on the mantel, on a floating shelf, curio, bookcase or on top of dresser/end table. Use a large wall decal or piece of art to draw attention to the theme and the eye can explore the rest of the accessories as you move throughout the room. Owl lamp: Place on a table by a chair or corner reading area. Wall art: Use a large piece above a console table or make a grouping above a mantel or sitting area. Vases: Either use as display vases or fill with flowers. Photo holders: Use these fun holders for a grouping on a mantel, coffee table, or sofa table. Candle holder: Set a votive candle holder or lantern on an end table or grouping on a coffee table. Throw pillows: A fast way to introduce a new motif theme is with throw pillows. Use two or three different designs that repeat the colors of your decor. Mix with solid, checkered and striped pillows. Fan: A decorative fan will keep the air stirring or can be set as a decorative object on the hearth. Most bathrooms have limited space for decorative objects. The largest areas are the wall. Take advantage with wall art, such as framed art or metal art. coordinating bathroom rug, shower curtain, and toiletry sets can create a theme with little effort so go for this scheme for a quick and easy design change. Shower curtains: Select a shower curtain that repeats one or more of the color scheme in the bathroom. Bathroom coordinates: Choose two or three items, like shower hooks, toothbrush holder, soap dish, lotion pump, waste basket, and tissue box, to enhance the room. Be careful not to overdo it. Bath towels and rug: Add matching towels and rug to coordinate with a shower curtain. Decorative soaps: Use different types of owl-shaped soaps in a plain soap dish for a dramatic effect. Start by picking out a great wall decal for decorating a kid's room of any age, whether it's a nursery, kid's or teen's bedroom, or playroom. Use peel and stick decals that are easy to remove. Decals can be placed behind beds, over nightstands, dressers, or on an accent wall. Children's room can be coordinated with owls and virtually any color they desire from yellow to pink to blue. Look for other owl decorations for children of various ages that fit their color scheme. Bedding: A matching pink bedding set includes sheets, shams, comforter and pillows. Wall coat rack: Keep bedrooms and playrooms neat with this colorful wall mounted coat rack featuring three hooks. 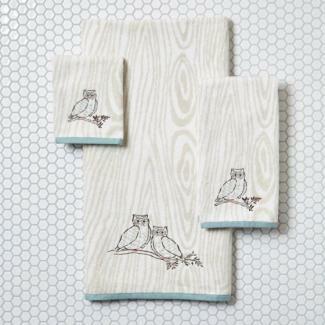 Nursery bedding: Look for coordinated multi-piece nursery bedding that features cute owls in a tree peeping over the crib railing. Playroom curtains: Fun and colorful curtains with each owl sporting a different facial expression will make playtime fun. to how each item will fit into your overall design. Generally, the master or guest bedroom will not have as many themed items as a child's room. Just a few touches will likely create the right look -- for example, a sign over the bed with a small figurine next to it or a clock with an owl motif. 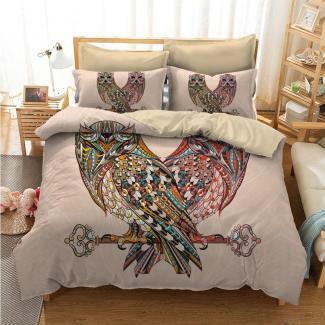 Duvet cover: The tree and owl design duvet is lightweight and can be used any season. This is a great choice for an eclectic or modern room design. Lighting: Choose from a beaded night light, hand-craft glass accent lamp or several other table lamps. Tiebacks: Solid brass curtain tiebacks are a great subtle touch for any bedroom without being intrusive. When you add decorative owl items to your décor, you don't want them to look out of place. The key to adding a specific motif to a room design is to use it sparingly. 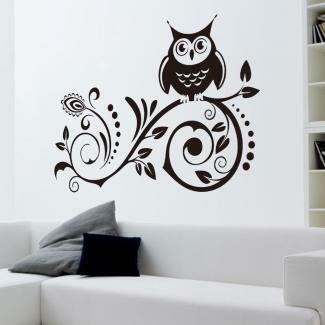 Don't overpower the room by cluttering it with owl decorations. The goal should always be design balance. Add a few items, take a step back and determine if more is needed or if you've found that balance.